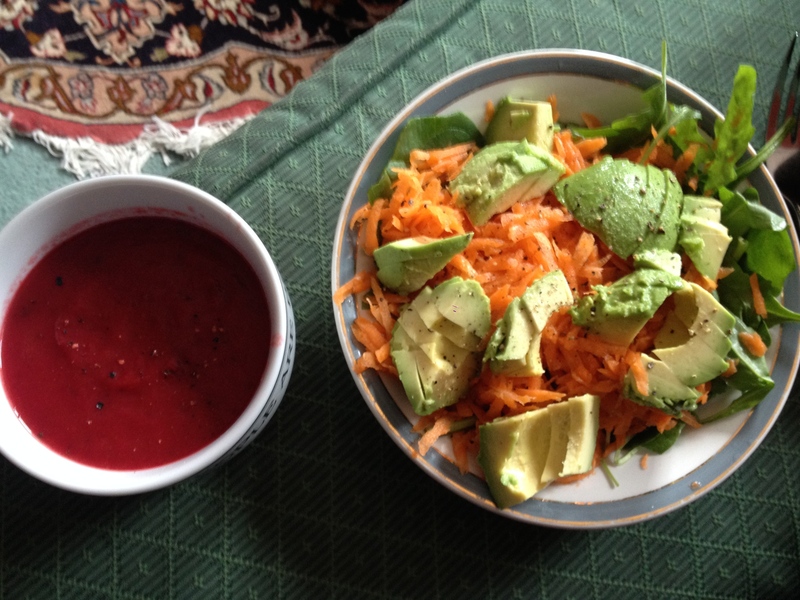 Beety blend… a Beet, ginger and coconut milk soup! Saute onions and garlic in your coconut oil, add your ginger stirring frequently. Add your beets and 4 cups of stock*, bringing to boil and then reducing heat. Cook until beets are tender (roughly 20 minutes). Blend soup using a hand blender or equivalent adding the remaining cup of stock. Stir in coconut milk, salt and pepper. Serve with a dollop of coconut cream or chopped chives. *You can use vegetable stock cubes or make your own vegetable stock; put all the ends of your veggies throughout the week into a sealable bag in the fridge, when you’re ready for stock, pour that into a pan, cover with boiling water so that you can just about stir the veggies, and then cook for an hour (or for however long life is giving you) then drain the stock and use it for your soup! What’s your favourite autumnal soup? thanks nicko, I’ll make it again soon!